Itchy, dry and sensitive skin finds relief with Avene, Cliniderm and Aveeno! Avene XeraCalm A.D Lipid-Replenishing Balm - 200ml - $28 - a fragrance and paraben-free balm that nourishes very dry skin and soothes itching sensations in infants, children and adults due to dry skin, while soothing redness and irritations caused by skin hyperreactivity, allowing skin to protect itself once again. Contains CER-OMEGA - to repair and nourish the skin while strengthening the protective hydrolipidic film along with Avène Thermal Spring Water: - to soothe, reduce sensations of discomfort and soften the skin - for skin that is soothed, nourished and comfortable. 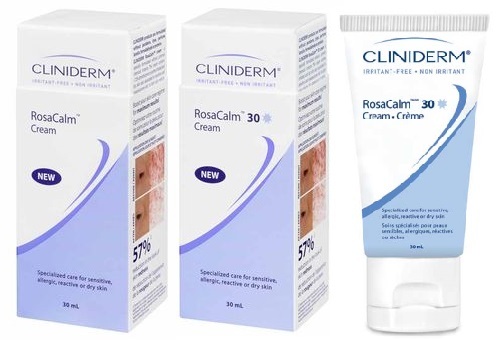 Cliniderm RosaCalm Cream - 30ml - $29 - rosacea sufferers will especially appreciate this paraben, dye and perfume-free treatment designed to immediately reduce the appearance of redness and restore a more uniform, healthy-looking complexion while preventing future damage. With medicated ingredients which provide anti-itching and anti-irritation benefits in a formula that also protects the skin barrier, promotes cell renewal, accelerated would healing, stimulates collagen synthesis, protects from environmental aggressions and contains anti-inflammatory properties. The cream also contains a green pigment which works to immediately conceal redness. I especially like that there is a version with SPF - Clinderm RosaCalm Cream 30 - 30ml - $31 - with all the same great benefits along with an SPF 30. Aveeno Active Naturals Skin Relief Hand Cream - 97ml - $9.99 - a fragrance-free cream that relieves and soothes extra dry, itchy, cracked skin with a formula that combines natural colloidal oatmeal with rich emollients in a fast absorbing formula which provides a protective barrier against the elements for 24-hour moisturization and naturally beautiful skin. Available now at food, drug and mass merchandisers across Canada.